part of a nationwide tour. contains Keane’s usual quota of madcap characters. 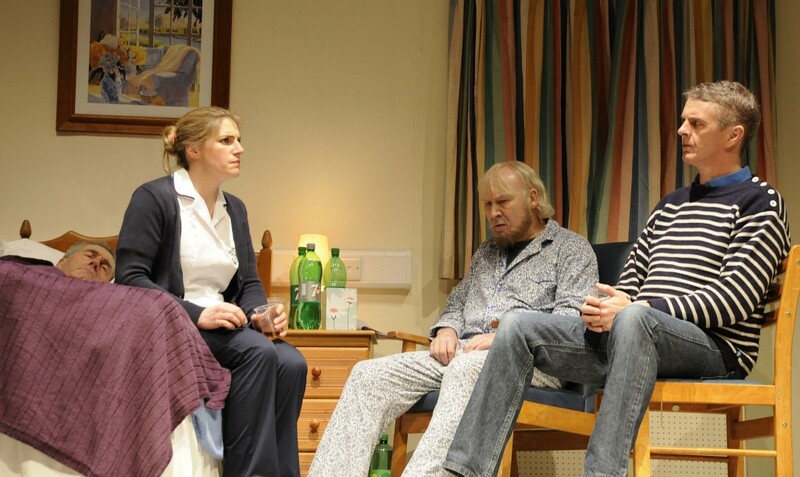 After a successful campaign on the amateur drama circuit during March with its production of ‘The Quiet Moment’ by Mike Finn, Skibbereen Theatre Society has qualified for the All-Ireland Confined Drama finals in Castleblaney, Co Monaghan, in mid-April. The final weekend, they won both the West Cork Drama Festival in Rossmore and the North Cork Drama Festival in Charleville, again also picking up several individual awards for acting and production. They ended up with three wins, two seconds and two thirds. 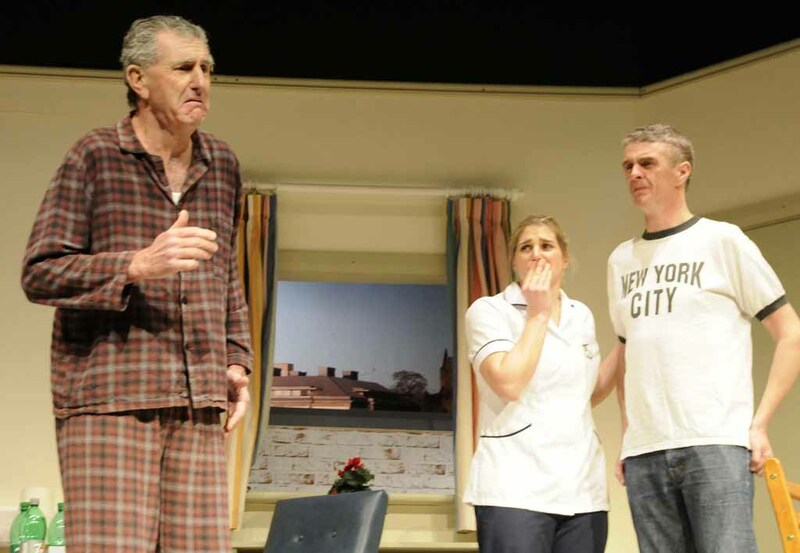 In advance of the All-Ireland finals, they will be staging two more performances of ‘The Quiet Moment’ at Skibbereen Town Hall on dates to be confirmed – probably during the second week of April. 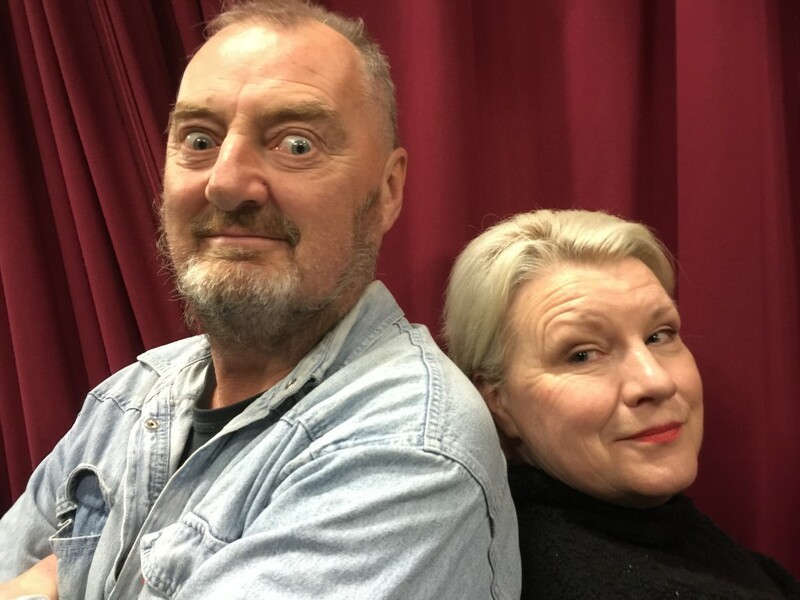 Skibbereen Theatre Society’s Spring 2016 offering is ‘The Quiet Moment’ by Limerick playwright Mike Finn, which they will be performing on the amateur drama festival circuit during the month of March. It opens at Skibbereen Town Hall on Wednesday next, February 24th, at 8pm. After a break for the general election polling in the Town Hall, it will be on again there on Saturday and Sunday, February 27th and 28th, and finally on Wednesday, March 2nd, before embarking on the festival circuit. Tickets are available in advance from Thornhill Electrical, tel 028-22557, and there will be a complimentary wine reception to mark opening night to opening night on Wednesday next. The cast includes Mary O’Driscoll, Fachtna O’Driscoll, Declan McCarthy and Gerry Minihane, directed by Hilda Hegarty, with Catherine Field as assistant director. 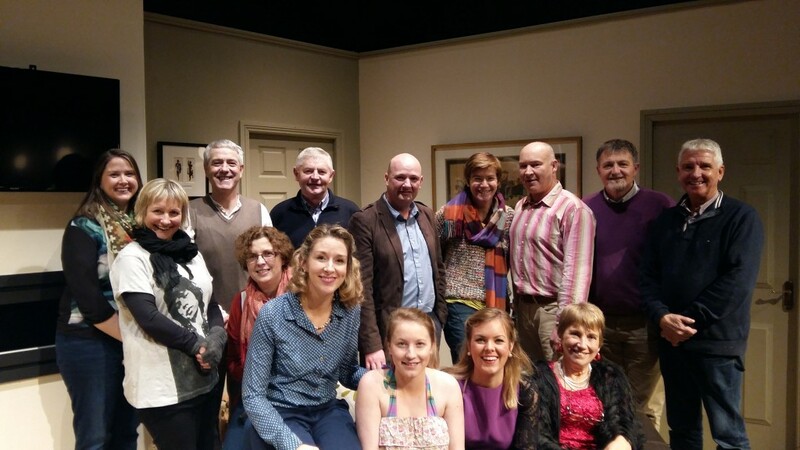 SKIBBEREEN Theatre Society’s Christmas comedy offering is Bookworms by Bernard Farrell. Directed by Hilda Hegarty, it will be performed by a cast, which includes a nice blend of experienced actors and newcomers, this Saturday, Sunday and Monday, January 2nd, 3rd and 4th, at Skibbereen Town Hall with curtain at 8pm each night. Two further performances are scheduled for January 7th and 8th next. It tells the story of book club host, Ann, struggling to stay calm, desperate to deliver the perfect evening of literary classics and late-night canapés. But when the all-female group invite their husbands to join the club, and a mysterious figure pays a visit from upstairs, everyone is forced to contend with a lot more than just Virginia Woolf! Opinions are challenged; suspicions aroused and tempers flare as their daily lives unravel into a saga to rival even the wildest fiction. The cast of Bookworms includes Breda Herlihy as the put-upon Ann, as well as Catherine Scroop, Carmel O’Driscoll and Isobelle Nealon, Kevin Cadogan, Ger Minihane and Sean Conmy. The stage manager is Niamh Woods. Lighting is by John Hegarty and Gearóid MacEoin, with sound by Fachtna Hamilton, who also were part of the set construction crew that included Barty Connolly, Con Minihane and Charlie Keohane. 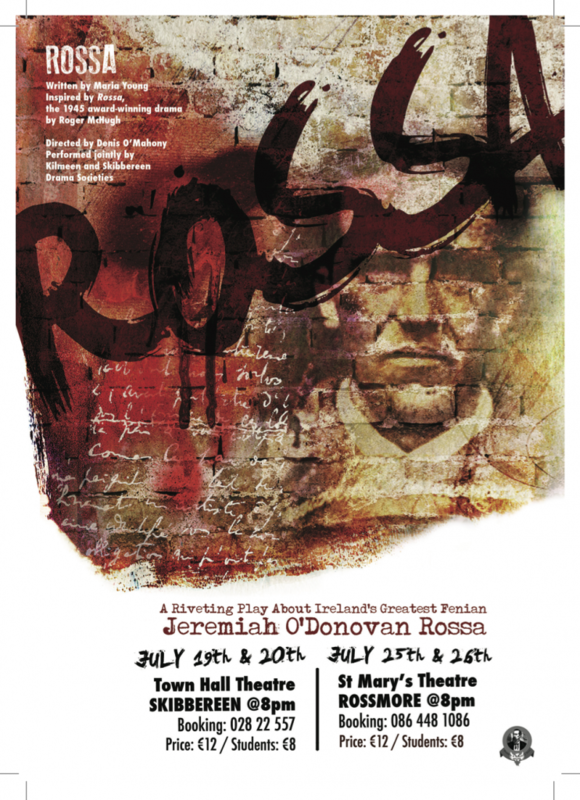 A play about the colourful life and times of the West Cork-born Fenian Jeremiah O’Donovan Rossa is to be performed in both Skibbereen and Rossmore this month as part of the events commemorating the centenary of his death. 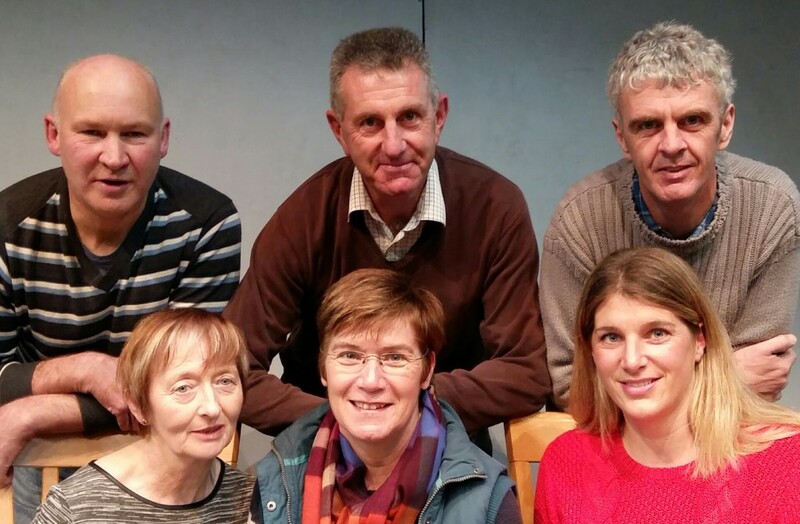 Directed by Denis O’Mahony, the joint production between Kilmeen Drama Group and Skibbereen Theatre Society, which is called Rossa, also involves members of other West Cork drama groups and is written by Maria Young, inspired by Roger McHugh’s award-winning play. It will premiere at Skibbereen Town Hall on Sunday and Monday, July 19th and 20th, and will feature at St Mary’s Theatre in Rossmore on Saturday and Sunday, 25th and 26th, nightly at 8pm in both venues. Dublin-born Roger McHugh (1908-1987) remembered his grandfather describing the silence of the countryside after the Famine, where the birds did not sing. He grew up with an interest in history and it was in that subject that he first lectured at UCD before going on to become a Professor of English. Roger became a Senator also and wrote several plays, most of them based on historical subjects, and the best-known of these was Rossa, which won the Abbey Theatre Award for best historical play and was performed there in 1945. Tickets for the 2015 production of Rossa may be booked for Skibbereen through Thornhill Electrical (028-22557) and for Rossmore through the theatre box office (086-4481086). In advance of shows in both Dublin and Cork later this month, Karen Underwood – one of Ireland’s best-kept musical secrets – will be performing at Skibbereen Town Hall on Sunday, July 12th. Her show is called The Nina in Me and tells of a Chicago diva’s struggles through the medium of sweet soulful music. In Cork, Karen is revered as one of the foremost talents in jazz, blues, and soul. 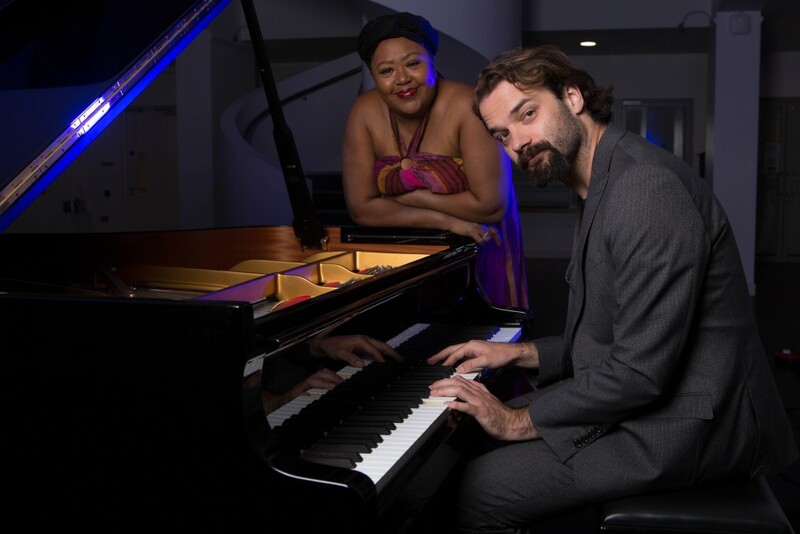 The impeccable technique of Karen, and pianist John O’Brien, coupled with a mastery of composition and storytelling, makes this concert a memorable experience. Karen not only has the music, but she has the story as well: The Nina in Me is a musical adventure in which she helps the audience explore Karen’s and Nina’s lives through music and discuss issues of religion, race and sexuality in America and Ireland. In The Nina In Me, Karen recounts her restrictive church-going years, the periods of intense personal and social suffering during the post-Civil Rights era and, more recently, her experience in a state that, until recently, did not recognise her right to marry the person she loves. Karen’s life is a triumphant story; a soulful struggle. John O’Brien, Karen’s best friend, decade-long partner in music and winner of two Irish Times Theatre Awards for opera, adds artistic delicacy and passion to music. No other pianist shares his strange gifts of sophistication, accessibility and downright joy. If you want to experience this different type of concert, tickets for The Nina in Me on July 12th are available in advance from Thornhill Bros Electrical, Skibbereen, telephone 028-22557. 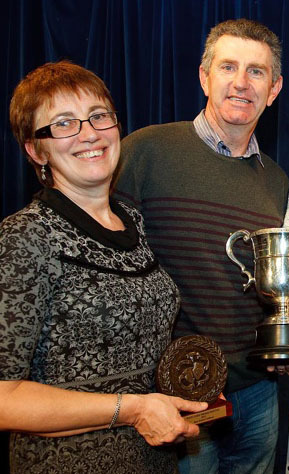 John O’Brien and Karen Underwood who will be performing ‘The Nina in Me’ at Skibbereen Town Hall on Sunday, July 12th.